Lenovo (formerly IBM) is the largest PC manufacturer in the world and has been at the summit for a number of years now, producing some of the highest quality equipment on the market. Their flagship ThinkCentre range caters to medium-large business enterprise customers who demand high-end performance and full accessibility for their machines. The refurbished range has recently increased in popularity with home users recently due to the power and speed capabilities in comparison with similarly priced new computers from high street retailers. The Lenovo M90p comes with a Westmere 1st generation 3.20GHz Core i5 processor with integrated Intel HD Graphics and a quad thread count. This model also comes with 4GB of memory for operational efficiency and a huge 750GB hard disk drive for storing documents, photos and videos. The M90 has VGA and DVI video output, a serial port as well as x8 USB 2.0 slots, audio input/output and wired Internet connectivity. 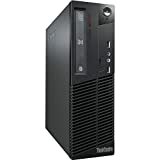 This entry was posted in Desktop Computers and tagged 3.20GHz, 750GB, Certified, Core, Intel, Lenovo, Professional, Refurbished, ThinkCentre, Windows by Computer Education World. Bookmark the permalink.